One aspect of the Manawatu’s environmental history which I completely neglected in my book Ravaged Beauty: an environmental history of the Manawatu, was recreational canoeing on the Manawatu River. Yet I have since discovered that it had a most illustrious history, according to Murray Fyfe’s history of recreational canoeing in New Zealand, published in 1972. The club headquarters remains on the Lagoon today, where it continues to flourish. Not so, its races on the river itself though – I suspect that there have been few canoe races or events on the river for many years. It would be interesting to discover why – and whether the deteriorating quality of its waters was a factor. 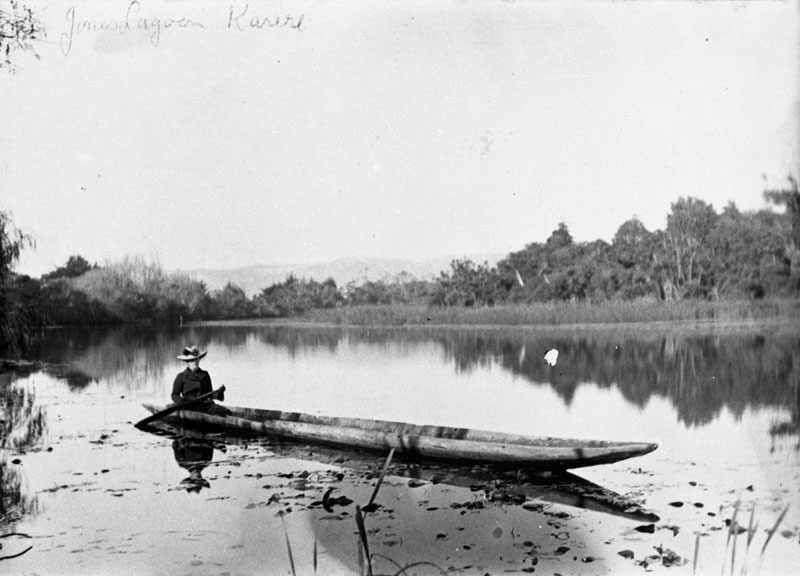 Disappointingly, I was not able to find a historical photograph of canoeing on the river – or indeed the lagoon – but I did find this charming photograph of a lady boating on the Karere lagoon in about 1905, around the time that Davie Dilks was organising the Manawatu’s first river race. Today you go down to the lagoon and see quite a number of birds and of course the rowing course. But there is also the regular site of dead ducks and large quantities of rubbish floating on the lagoon at the golf course end of it. I find it interesting that the people who live in those spectacularly built expensive houses don’t seem to mind sitting drinking their coffees and wine looking out of very noticeable pollution and do absolutely nothing about it. The whole area is run down and a mess, the teachers college (no longer is teachers college) if in desperate need of an upgrade, “The chalet” as it is called by the canoeing club is in about the same state and the toilets are absolutely disgusting. It’s advertised as a picturesque place to hire for weddings and events but I’d be highly disappointed to be celebrating my wedding looking out over the mess that is now the lagoon and the canoeing club does absolutely nothing to clean it up, along with the council.